The other day it was frigid fifteen degrees outside and we found ourselves cooped up with 15 wiggly, silly preschoolers. Luckily I had the perfect project for such a day. Armed with mortar, pestle and a large supply of lavender blossoms, the kids and I settled down for some serious grinding and pounding work. As we passed the mortar and pestle around our little circle, I encouraged the kiddos to smell the flowers while they pounded. Within minutes our circle became peaceful with everyone looking on and inhaling the beautifully calming fragrance of lavender. 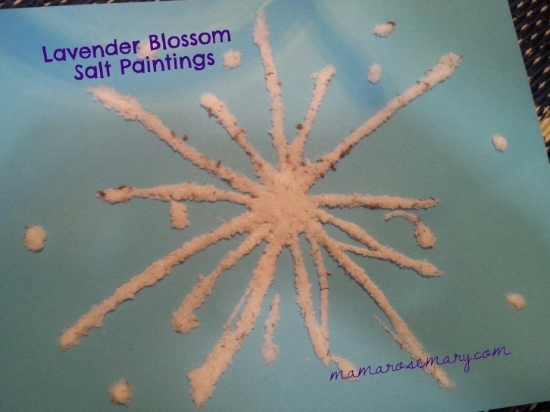 When we were done playing with the mortar and pestle we took our ground up flowers combined them with salt and lavender essential oil to create a fun art supply. Need lavender blossoms and lavender essential oil? 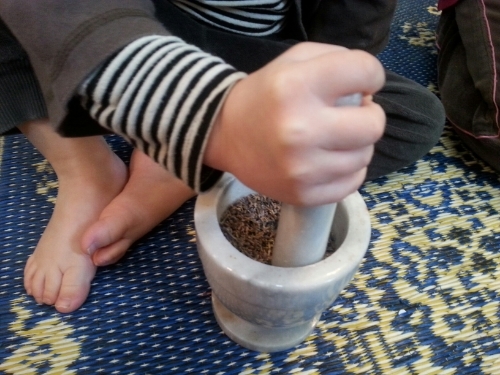 Just grind and pound some lavender blossoms with the mortar and pestle. The kids love this part. The cool stone of the pestle combined with the action of grinding and the smell of the lavender is a real sensory experience. Dump the flowers into a bowl along with some salt and a few drops of lavender essential oil. Pass the bowl around, giving everyone a chance to stir. Be sure to break up any salty clumps from the lavender essential oil. 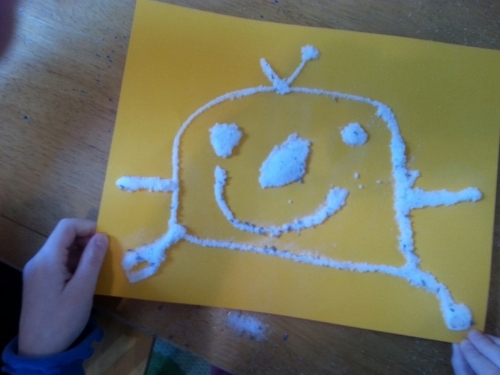 Provided bottles of glue for the kids to squirt on dark cardstock to create a picture. You might want to show them how they can “draw” a heart or star (or whatever inspires you) with the glue to give them the idea. Then sprinkle the beautiful smelling salty lavender salt over glue. Make sure to cover all of the glue with the salt and flowers. 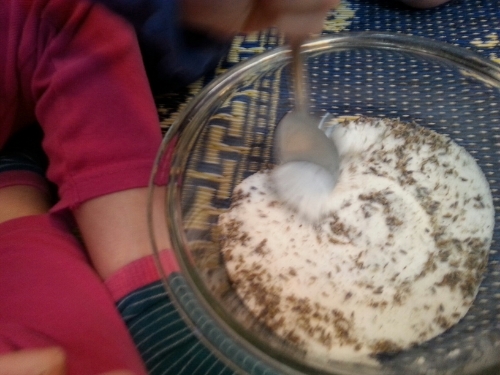 Finally, help the child pour off the salt (we poured ours back into the bowl) and enjoy the lovely creation! The children loved this craft. When it dries it looks like sparkly snow and smells wonderful. I was really surprised by how much they enjoyed it. Many of the kids made 2 to 4 pieces of art work and wanted to do it again the next day! 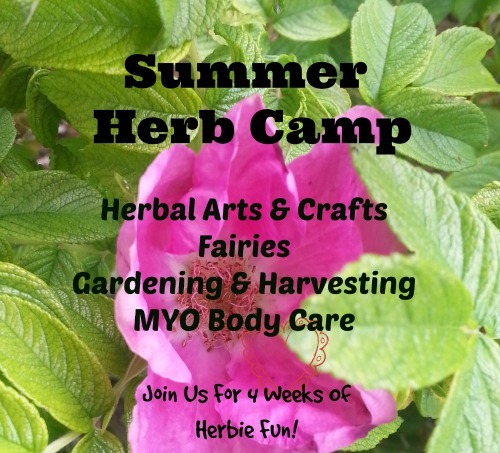 Please note: Mountain Rose Herbs is an affiliate link for Mama Rosemary. If you buy from them by clicking links on this website and then making a purchase, I get a small percentage of the order back as commision. This does not in anyway effect your purchase price, however it does help me maintain this website for your enjoyment! Thank you so much for your support!